The poem below, written on Broadhaven beach whilst looking across towards Little Haven as the light that preceded dawn slowly unfolded, brings together all the strands that hold so much of my work together; birds, the coast, light, photography and time. Only the sound announces the gulls’ presence. Only to join once again the edge they belong to. Five minutes, and the edge widens. And the gulls’ prolong their stay. But not yet to the form that gives understanding to the hour. Then the edge has gone. and we slump once again into predictability. During this hour in the morning we lose our conventional way of experiencing the world and are taken into new realms of perception both visually and within the mind, but we need to slow down to experience it. is an indictment of our lack of willingness to enter new worlds and explore new meanings to our every day existence, not only at the time of these edge moments but during all of our waking hours. These moments serve to heighten the extent to which we need to open ourselves up to new possibilities of seeing and to slow down to see them. To photograph such moments is to give some permanence to them and despite photography’s hopelessly inadequate claim to a sense of reality, it at least serves to suggest that they exist and as such we are able to in some way reference them. understood the idea that nothing endures but change and that change is the only constant; the doctrine of flux. The coast is perhaps the most obvious element of the landscape that visibly exhibits the doctrine of flux yet it operates everywhere. Tides ebb and flow twice in twenty four hours and on the coast of Glamorgan this ebb and flow is exaggerated more than most places. The fifteen metres in changing altitude here between the tides is the third greatest in the world. We are aware of it but seldom spend time watching the change. Tide cycles occur roughly at 12 hour intervals, the coast may look very different at each visit but to witness the gradual climb and fall of the cycle is not something that is experienced often. Time is against us, always something else to do, no chance to slow down. …We sit in the shade beneath a tree. Kumar removes his socks and shoes and sinks his well-travelled feet into the long grass. I ask him about time-sickness. But your mother lived her whole life in rural India, I point out. Surely the pressure to speed up, to beat the clock, is irresistible in the modern world. 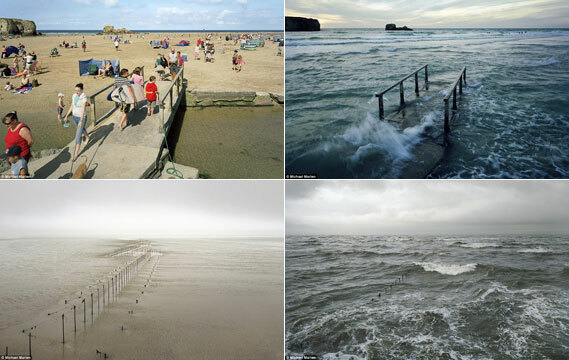 A recent body of work by Michael Martin, ‘Sea Change: A Tidal Journey Around Great Britain’ re-enforces our attitudes to this idea we must ‘beat the clock’ Firstly the work is quite beautiful and Martin’s choice of location, detailed research and technical prowess is to be admired. However, and I really did enjoy looking at the work, it ignored the time in-between the pairs of images. It seemed to say that visit now and in another six hours and you’ll get the idea. I felt that the void in-between the images suggested another world when Martin could ‘get on with other things’ and thus a dislocation from the work itself. He may well have the in-between images if so, I would have liked to have seem them as part of the exhibition rather than a series of pairs and the direct comparisons of tide in and tide out that the exhibition comprised of. The series of images I took from Nash Point on the Glamorgan heritage coast embody time in a way I feel Marten’s don’t. I was there all the while, I took ‘the time’, experienced the event and enjoyed the pace. Time lapse photography is perhaps the worst example of how dislocated we have become to the event itself. Time is collapsed, and often the camera has been programmed to take images without anyone actually being there at all. We gain no personal sense of change and there is, as in Marten’s work, the idea that we can no longer cope with real time anymore and that it somehow has to be processed. It could be argued on the other hand that time lapse opens up and explains processes that are otherwise genuinely difficult to comprehend and inspires people to seek real experiences. If, however, it becomes an excuse to short cut first hand experience then it denies any meaningful contact with real time and change and once again moves us towards the idea that we can ignore the space between change. It is this space that is so important to maintaining a better balance between life’s pressures and natural rhythms. Perhaps the best use of time lapse photography that has real sense within the context of how it appears is to be found in the ground breaking film Koyaanisqatsi. The passage of time in both the natural world and the urban sprawl are heightened to illuminate the pace of a world in disharmony. I do though sometimes wonder if the film of the cloudscape series should have remained at normal speed thus highlighting the imbalance between the pace set by man and the more relaxed pace of the processes that shape the natural world. This imbalance manifests itself in our own inability to step off the relentless treadmill of modern living and to experience again the natural rhythms of life. The hour sat writing that poem on Broadhaven beach would, in todays fast paced world, probably be coined a luxury, time wasted even. Maybe I wrote to justify my time there, still in my mind ‘doing something’. I’m caught up in the time disease as much as anyone else and have to consciously steel myself to escape it, not always succeeding and often left feeling guilty.